Holiday River Expeditions was incorporated in 1966. Since then ownership has not changed. We are still a family-owned-and-operated business. An inherent company philosophy is that we exist to protect the environment through education and conservation. 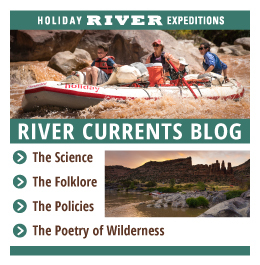 Part of this philosophy is evident in the fact that Holiday runs strictly oar-powered and/or paddle rafts, as opposed to motorized rafts on our trips. With more than 50 years of experience we understand that safety is the most important aspect of any wilderness vacation. We take great pride in every important detail of planning your vacation. Our boats and equipment are top quality and impeccably maintained. Our guides are the best in the business, each trained professionally in river safety and first aid. We proudly are the 2003 recipient of the Canyonlands National Park Safety Award. There are also the little extras we offer – interpretation of natural history and ecology, impressive meal presentation, kids activities – that make the Holiday experience a unique one.